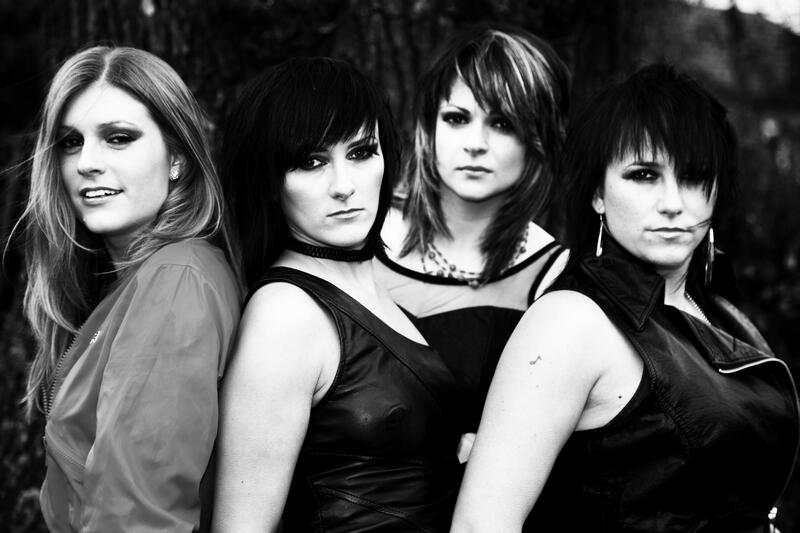 JOAN ov ARC – FIRST UK FEMALE BAND TO FEATURE ON THE ‘ROCKBAND’XBOX 360! SUPPORTED BY GIBSON – RECENTLY REVIEWED IN KERRANG MAGAZINE! The girls hail from London and the Home Counties and have built up their strong musicianship and strong representation of women in rock through performances worldwide. JOANovARC have combined influences from Motorhead, Metallica, Joan Jett, AC/DC, Led Zepplin, the Foo fighters and Kings of Leon to create their own unique sound. JOANovARC have performed worldwide – in the USA, Mediterranean, the Caribbean and have extensively toured Europe. They have performed at the Harley Davidson European Biker Festival in Austria; the Harley Chopper Show in Slovakia; Germany Army bases and have electrified audiences in the UK with venues including the London Astoria; Cafe de Paris; the Garage; Barfly and the O2 Indigo. The girls have played at festivals including Rhythms of the World, Namfest, Fordham Festival, Brighton Pride, Go Go Festival, Cambridge Rock, BMF Biker Festival Peterbough arena and many more. They have also supported Girl School, Top loader, Marillion and Bad Company’s Dave Colwell. In 2011 the band promoted their first Rock Band release with their track ‘Sisters’ followed by a successful launch at Club 85 and the BBC West Once Club in London. After the launch and the release of the promo video online JOANovARC gained a lot of media coverage and a new worldwide fan base! Throughout 2011 the girls shot their debut music video ‘Peace of Mind’ with Rachel Price of BBC Bristol with thousands of hits on YouTube! They also released their debut EP ‘Beneath the Sky’ on iTunes which was promoted on radio and TV stations across the world – and gained a publishing deal with Speegra Music in the UK and Veal Steen in the USA! In 2012 the girls played their American Tour showcasing on the Main Stage at Florida Music Festival. Michael Waggoner, Managing Director of Gibson Guitars USA watched the girls’ performance and was blown away – So much so that the girls returned to the UK with worldwide artist support from Gibson! Throughout 2012 JOANovARC performed at many festivals in the UK and Europe (including the Harley Davidson Chopper Show in Austria), had various photo shoots in London, vocal sessions with the legendary Stevie Van Lange and recorded their full – live in the studio – album with Stephen Loveday from Medicine Hat. JOANovARC also promoted their 2nd release for Rock band 3 on the Xbox 360 with their Japanese track ‘Say Sayonara’ with a launch gig at the legendary 100 Club in London. JOANovARC have a lot in store for 2013 and recently recorded their live in the studio album! Their demo was reviewed in the February issue of Kerrang Magazine by Rock God Andrew WK! The girls are already booked for BMF Biker Gigs over the UK and will be touring in the Netherlands and the middle east throughout 2013. “Totally mind blowing and it is no wonder that this band has been recently gigging on the European mainland. All the tracks are of a high calibre alternative rock style, with catchy melodies galore.